The source of the hot spring is at 1,300m in the middle of Mt. Chausu. 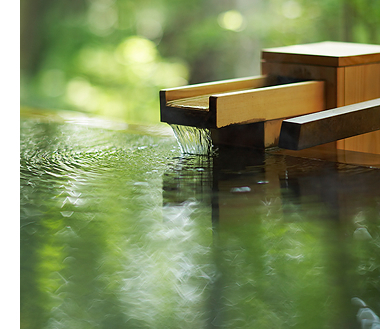 The hot spring’s water is the same water used by the Imperial family at their summer house.The water is good for your skin and helps you recover from fatigue, and also relax and sooth your mind. Efficacy : The water makes the skin beautiful. Pregnant women can take the onsen. Effective for neuralgia, aching joints, stiff joints, chronic digestive system disorder, muscular pain, fatigue and so on. The water of the inside Bath is circulated and filtered under hygienic conditions. Please understand that the water will be controlled by adding some water or applying some heat to control the temperature. 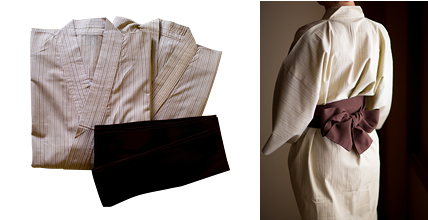 Japanese people usually wear Yukata after taking a bath. Come to our dining room in Yukata and use as pajamas in bed. *Please note that there are some days you are not able to take a bath between 12am to 6am due to maintenance. You can relax and enjoy your private bath time. Please book a family bath when you make a room reservation or after you arrive here. Each bathroom has a different time schedule. We apologize in advance that you may not be able to make a reservation at the time you requested.